See Wears Valley from above on a scenic helicopter tour from Sevierville. Your pilot takes you over this gorgeous section of the Great Smoky Mountains National Park, one of the most popular nature destinations in Tennessee. Look for landmarks such as Cove Mountain, Waldens Creek, and the Bluff Mountain foothills, and hear in-flight commentary from your pilot via 2-way headsets. 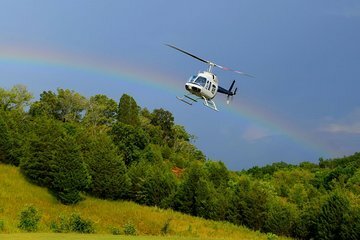 The helicopter covers about 36 miles (58km) of terrain on a flight that lasts about 18 minutes.